Online registration is now closed. Walk-in registrants are welcomed at the door of the event. 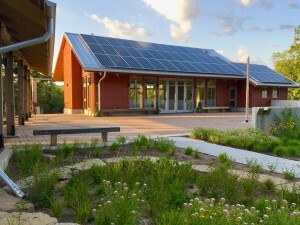 Experience the Jan Phillips Learning Center first hand and learn how the building incorporates principles of regenerative design and the Living Building Challenge to meet The College School’s mission to engage and captivate students through hands on nature-based experiential learning. Multiple elements of the center represent stories connecting visitors to nature and the community with a focus on creating opportunities for multi-sensory experiences and for curriculum integration. The building arrangement provides optimal orientation for passive solar heating, solar electric panels, and natural ventilation and offers 360-degree views. Strategically placed windows and skylights provide natural ventilation and admit daylight that constantly shifts in patterns, colors, and intensities throughout the day. The layout of the community building and pavilion/outdoor classroom are based on the Golden Section with the axis of each centered on the communal plaza which features a functioning daily and seasonal sundial. Water is featured in multiple ways including with a “watershed divide” that bisects the plaza, an interactive “stream wall” / aqueduct that channels rainwater from the roof to spill into a series of connected rain gardens inspired by beaver ponds, and a cistern used to irrigate the garden and orchard. Materials are Red list free to provide a healthful interior environment. A stone ‘geowall’ placed in layers of local limestone and sandstone represents the geologic strata of the region. The pavilion fireplace includes handpicked stones from natural environments. Salvaged materials from a variety of local sources are highlighted. Repurposed Douglas fir from the imploded St. Louis Arena furnishes the lobby wainscoting and ceiling. The main floor is made of salvaged white oak with an accent stripe of walnut salvaged from the site – presenting a unique decorative floor detail that ties to the plaza. Columns, beams and trusses salvaged from fallen trees at Jefferson Barracks support the buildings. Every piece of wood used is either certified sustainable, or salvaged, and is from within the region. Naturalized landscaping supports the curriculum as it also regenerates habitat and native plant, insect and animal species. The Jan Phillips Learning Center is in its performance period seeking full “Living” certification in the Living Building Challenge (LBC). Achieving certification would make this the second Living Building Challenge certified project in the St. Louis area. Following the seminar, join us for the launch of the International Living Future Institute – St. Louis Collaborative from 4:00-6:00 pm. Drinks and light appetizers will be served. More details and registration here.